BCECE Syllabus, Exam Pattern (बिहार संयुक्त प्रवेश प्रतियोगी परीक्षा सिलेबस) 2017: Aspirants who have applied for the entrance exam they must be looking for the study material to prepare themselves for the entrance exam. If we talk about the Syllabus of BCECE 2017, then we want to conclude that the questions included in BCECE syllabus are same as that of class 11th and 12th board examination syllabus. Applicants will be able to check the detailed BCECE Syllabus, Exam Pattern 2017 by following the details mentioned below. We have also included the Bihar Combined Entrance Competitive Exam Pattern 2017 which is very helpful for the candidates to score qualifying marks in the examination. For the admission, the applicants have to qualify this entrance examination and to assist in the same path we have included the complete details online here. The Applicants can check here the Syllabus of BCECE 2017 which helps an applicant to score good marks in entrance examination. This examination is state level exam for various engineering programs. The questions in the BCECE will be asked from the PCM syllabus of class 11th and 12th and the entrance exam is conducted by the Bihar Combined Entrance Competitive Examination Board for undergraduate applicants admission. The second part of the examination will be held separately. Applicants will be selected on the basis of their performance in the entrance examination that will be conducted in 02 phases. The final merit list will be decided as per the overall performance in both the phases Only the selected applicants who qualify the merit will be called for participating in the counselling process. The candidates will be allotted the seats as per the choices filled in the counselling form and the BCECE Merit 2017. After that, the candidates will be invited to visit the allotted campus and then they have to confirm their seats by submitting the admission fee after undergoing certain formalities. Applicants will get all the latest update of BCECE Syllabus, Exam Pattern in this article by following the subject wise details mentioned above. The syllabus of BCECE is based on the topics that are included in the syllabus of the 11th and 12th standard. If we talk about the BCECE exam pattern then we want to conclude that the entrance exam will be conducted in 02 phases (01st phase: 600 Marks, 02nd phase: 1200 marks). 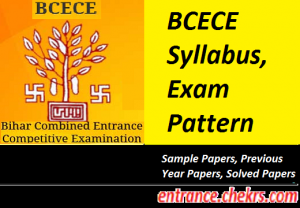 To become familiar with the complete syllabus, exam pattern of BCECE the candidates are suggested to follow the complete subject wise details above. For any of the queries concerning the BCECE Exam Pattern, Syllabus 2017, you can ask us for your queries by commenting at the end of the post.